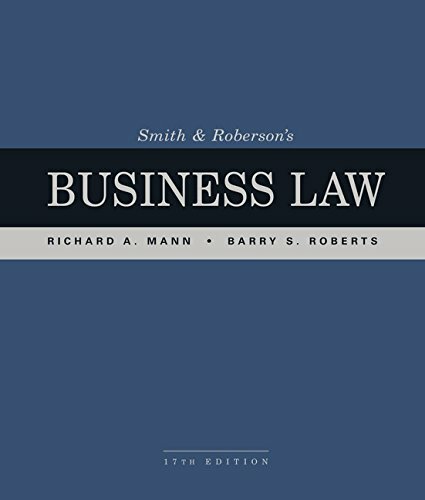 Today's most complete and credible business law text, SMITH & ROBERSON'S BUSINESS LAW, 17E by Richard A. Mann and Barry S. Roberts continues a tradition of accuracy with coverage of the latest issues and emerging trends. The updated, detailed presentation of business law provides excellent preparation for the certified public accountant (CPA) exam with coverage of business law, legal duties and responsibilities of accountants, and the corporate governance portion of the business environment and concepts. Cases blend landmark and current decisions with edits to preserve the language of the court. More than 220 classroom-tested figures, diagrams, and summaries emphasize the fundamental concepts, principles, and rules of law that apply to business transactions. Readers gain insights into the function and operation of courts and administrative agencies as well as potential legal problems for businesses. This trusted, thorough text ensures a solid understanding of modern business law. If you have any questions about this product by South-Western College Pub, contact us by completing and submitting the form below. If you are looking for a specif part number, please include it with your message.